The Sri Lankan government has arrested a popular astrologer who predicted that the country's president would be ejected from office. It's hard to pick the greater moron - the astrologer or the government genius who ordered the arrest. Probably the astrologer. He should have known better than to point the bone at a powerful figure in a country well mired in poverty and superstitious crap. Ahem. 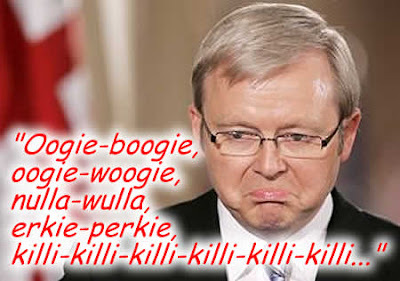 I shall call forth my previously well shaded psychic astrological powers once endowed upon me by the venerated Gnostrell Earth Goddess of Foon, and confidently predict that out present Nanny Prime Minister Kevin '07 Rudd will be STABBED TO DEATH by every single member of the present Labor Caucus on or before the next Ides of March. I mean, how much can they (or us) put up with? I am a long time Labor voter, but I am a little tired of all the self serving knee-jerk Mrs Grundy puritan crap oozing from this guy. He really would be better placed running for a spot in the U.S. Congress. They like that sort of thing there. ... and by the magic of magick, we can sit back and watch Kevvie's inevitable doom unfold.